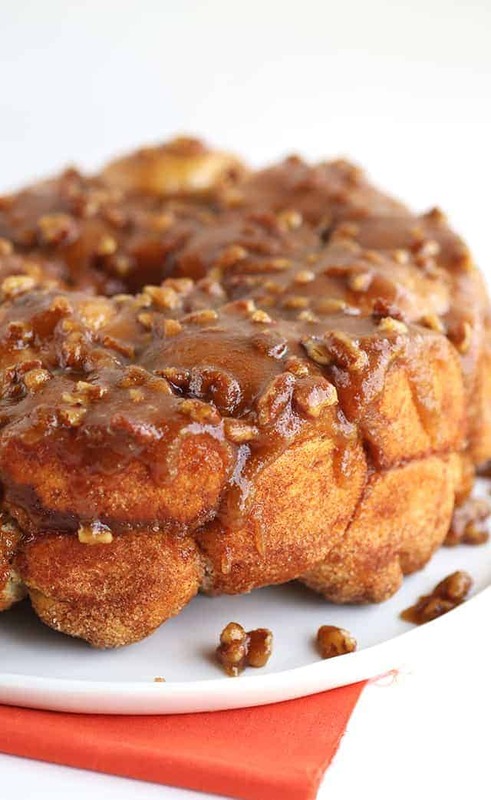 Pecan Pie Monkey Bread has become a family favorite here! 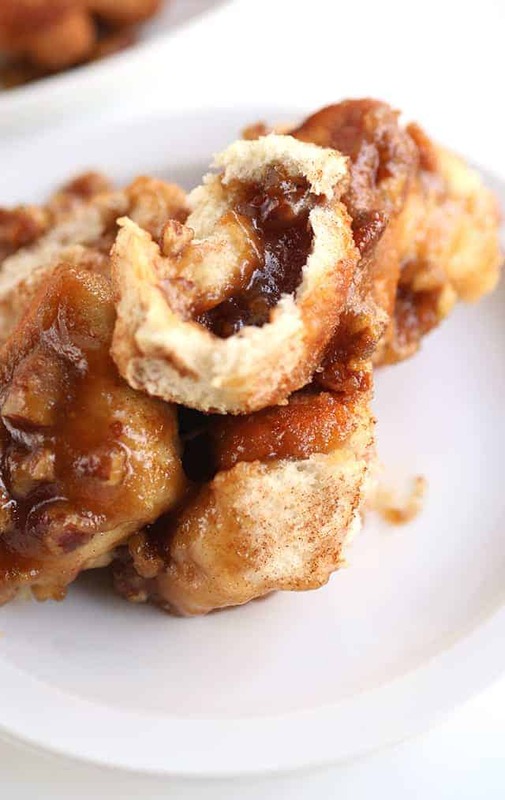 Those biscuits that are rolled in cinnamon sugar paired with the gooey, pecan pie filling inside, who could resist? I couldn’t! 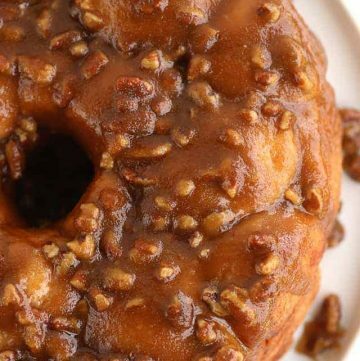 This is the perfect holiday breakfast and/or dessert (anytime). Monkey bread is near and dear to my heart. It’s one of my favorite desserts from my childhood. My mom’s good friend from back in the day would always make it and bring it to our house. It took all my willpower not to eat every biscuit that the brown sugar/butter mixture had touched. It also helped that I’m pretty sure I would have gotten in big trouble too. So yeah, I can NEVER leave my favorite recipes alone. I always want to tweak them, change them, improve them. Guess that’s why I’m a food blogger, right? Anyway, the pecan pie monkey bread was born. 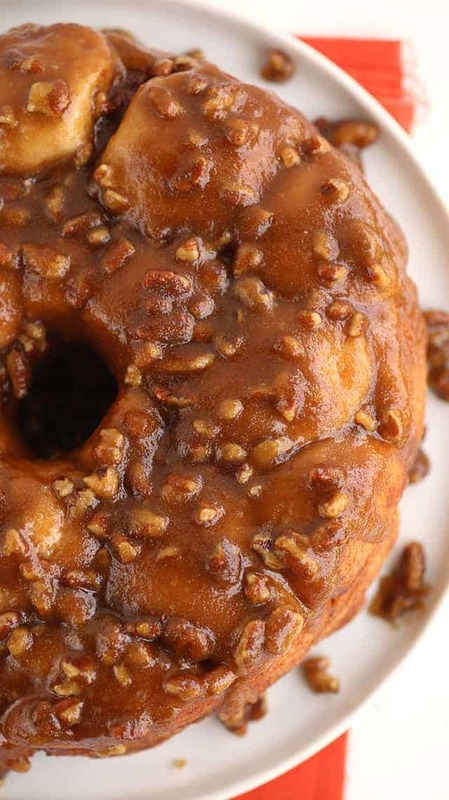 Pecan pie and monkey bread are equally phenomenal. Together, they are mind blowing. 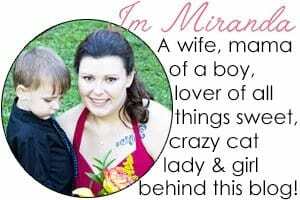 Do you know what else is mind blowing? 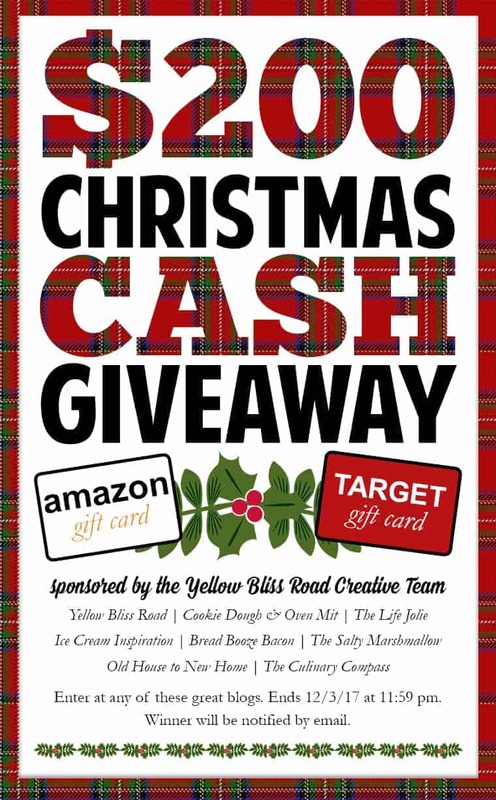 A giveaway for a $200 gift card or straight up paypal cash because it’s the holiday season! You have from now until through 11:59 pm on December 3, 2017 to enter. Who could use an extra $200 to buy Christmas this year? Take a chance, you have nothing to lose. I think the trickiest part of monkey bread is making sure the entire bundt pan of biscuits is cooked through. There is nothing worse than biting into a piece of raw dough and it stretches and/or it’s gummy. I get the heebie jeebies just thinking about it. I try to test them the best I can by pulling biscuits toward the center of the bundt to see if they’re still doughy. Go a few deep using a knife or fork to avoid getting burnt. If they are doughy, keep on baking. In a large saucepan, add the butter, brown sugar, granulated sugar, corn syrup, eggs, vanilla bean paste and pecans. Stir until completely combined. Place over medium heat stirring constantly until it comes to a boil. Let boil four 4 minutes until it becomes thick, stirring constantly. When running the wooden spoon on the bottom of the pan, the filling will spread apart and leave a path briefly. Remove from the heat and pour into a bowl to cool. Preheat the oven to 350 degrees. Spray a 9-inch bundt pan or tube pan with non-stick cooking spray. In a small saucepan, add in the butter and brown sugar. Heat on medium until the sauce is smooth, stirring often. It will take about 10 minutes. Pour the hot sauce into the prepared bundt pan. Set aside. In a shallow bowl, add the granulated sugar and cinnamon. Stir until the cinnamon and sugar are combined. Unwrap the tubes of biscuits. Flatten the biscuits in your palm. Cup your hand and stretch the biscuit so it can hold 1 to 1 1/2 teaspoons of cooled pecan pie filling. Add 1 to 1 1/2 teaspoons of cooled pecan pie filling. Pinch the biscuits together to seal the filling in. Roll the biscuits into the cinnamon sugar until they are completely covered. Place into the bundt pan on top of the brown sugar mixture. Continue to roll all the pieces into the cinnamon sugar and layer them in the bundt pan. Place into the oven for about an hour. If the biscuits on the top are getting too dark, make a tin foil tent by ripping off a large piece if tin foil and folding it in half. Place it on top of the biscuits to prevent further browning. Pull the biscuits from the center of the bundt. I would recommend using a fork and digging down a couple of layers if you're unsure whether the monkey bread is done. If the biscuits look doughy, bake longer. Once the monkey bread is baked let it cool for 10 minutes. Run a knife around the outside of the pan and the center. Place the serving plate inverted on the bundt pan. Flip the pan upside down so the bread is sitting on the plate. Slowly pull the pan off the bread. The brown sugar mixture will drop down the sides and coat the cake. Rules: Prize is valued at $200 in the form of a gift card or cash. Sweepstakes will run from 12:01 am on November 27, 2017 through 11:59 pm on December 3, 2017. This sweepstakes is not sponsored in any way by Amazon, Target or Paypal. Must be 18 years of age to enter. Winner will be chosen at random, verified, then announced on the giveaway widget in this post and will be notified by email. Winner will have 48 hours to respond or another winner will be chosen. Void where prohibited.